This is a thrill and to be sure seen by a lot of people! 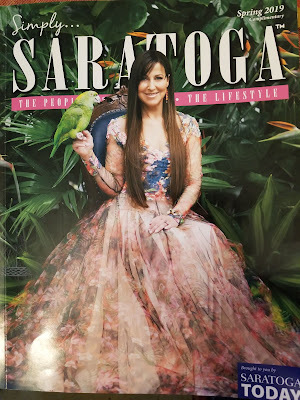 This is the text of the feature article in Simply Saratoga, Spring 2019, by Dan Lundquist, photos by Marisa Scirocco! 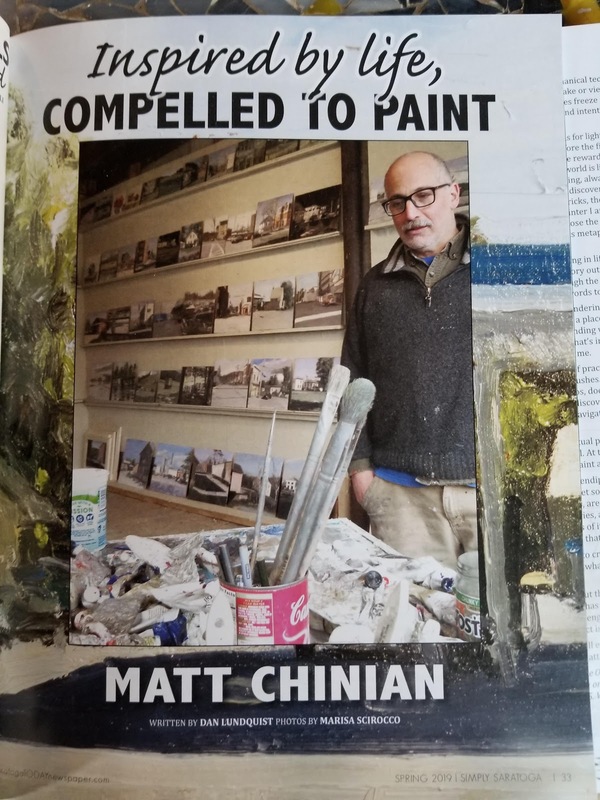 For local artist Matt Chinian, painting is a somewhat focused, “intentional” way of paying attention to things, thinking about them, and then presenting/sharing/translating them through words and images to try and share a vision and values. When I visited Matt's comfortable, well-used studio (a spacious converted garage with lots of natural light and a crackling pot-belly wood stove at his house in Cambridge), we had a wide- ranging conversation as I browsed the "walk-in album" of hundreds of his plein air works. The space is rustic and comfortable. What might appear to be an “easy chaos” is Matt’s carefully-outfitted studio. When he walked me around the property Matt explained how he had renovated the barn across from the studio. 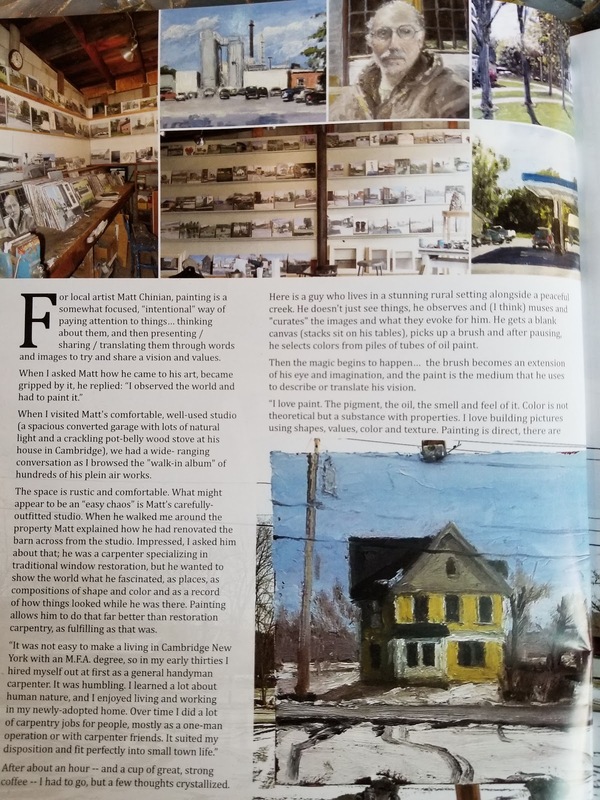 Impressed, I asked him about that; he was a carpenter specializing in traditional window restoration, but he wanted to show the world what he fascinated, as places, as compositions of shape and color and as a record of how things looked while he was there. Painting allows him to do that far better than restoration carpentry, as fulfilling as that was. After about an hour -- and a cup of great, strong coffee -- I had to go, but a few thoughts crystallized. what they evoke for him. 3) He gets a blank canvas (stacks sit on his tables). 4) He picks up a brush. 5) After pausing, he selects colors from piles of tubes of oil paint. Then the magic begins to happen: the brush becomes an extension of his eye and imagination and the paint is the medium that he uses to describe or translate his vision. “I love paint. The pigment, the oil, the smell and feel of it. Color is not theoretical but a substance with properties. I love building pictures using shapes, values, color and texture. Painting is direct, there are no intermediary steps no mechanical technologies and it needs no electricity to make or view. When the paint dries, my brush strokes freeze in time, they reveal the process, the action and intent with which they were made. The process itself — the “being in life” and digesting it, then putting a record, a story out there — is fun and fulfilling. Whether through the gift of painting or composing music or using words to tell stories. “My process begins with wandering. I go out, drive around in search of a scene, a place, a play of light. My search is as much of a finding within me and asking: how I can express what’s in me, by focusing something that’s outside of me. “There is an endless cycle of practical tasks and. Hours making panels, cleaning brushes. Lots of time on social media, managing photos, documenting the work, installing shows. There is discovery, always learning, always asking questions, navigating relevance, fighting sentiment. But when the creative serendipity (and focused effort) work and people get something out of it — find inspiration in images, are moved by music, enjoy and learn from stories, are intrigued, or best yet remember all or parts of it and possibly receive some inspiration — well, that’s the best. And the funny thing about that part (the artist’s intent) is that one often has no idea when that second part (audiences’ engagement) really works. Or what its impact is. But that’s okay. 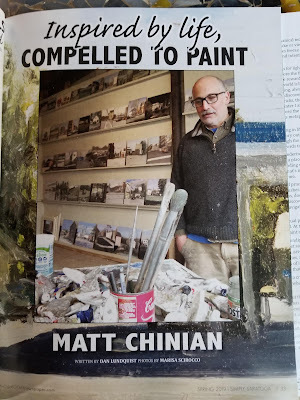 Some will engage, learn, and be moved... and in that is Matt Chinian’s fulfillment. Matt will participate in the Open Studios of Washington County, July 19-21, and a One day only Pop-up open studio, March Sunday, March 31, 10-5 visit mattchinian.com.